And in the last 12 months there have been some fine entrants into this sector to run alongside a few old hands, which it has to be said are still among the most popular bikes in the UK. 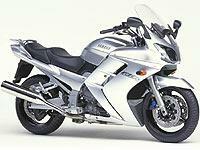 But the winner is a bike that has been reborn and captured the imagination of thousands of sports tourer fans…the Yamaha FJR1300. The FJR name has been with us for almost 20 years, but this is the latest and by far away the best incarnation of the bike. We’ve had conversations with everyone from hardened tourers to top racers who have ridden the bike, they have all loved it, which is a testament to its versatility.